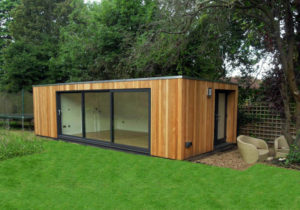 Order a 15sqm or greater garden office from INSITU Garden Offices by 1st September 2018 and they will include the office furniture for free. Lots of options to choose from and a space planning service to help you decide on your ideal layout. Garden rooms are designed in such a way that they can be transported along the tightest of access routes into your garden. If need be a garden room can be moved through your house. Fancy a green roof on your garden room? Well have you considered an artificial option – they look great and need no maintenance. 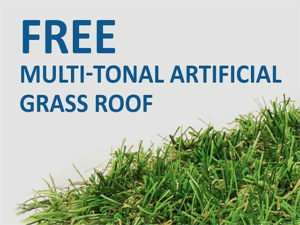 INSITU Garden Offices are offering artificial green roofs for free this summer on garden room orders. 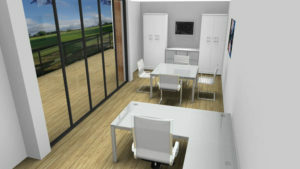 Insitu Garden Offices are able to design the interior working space as well as the garden office building itself, as this modern workspace shows.